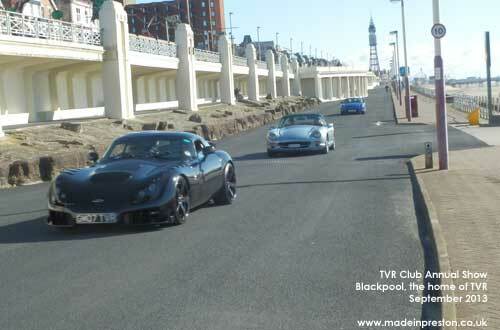 TVR?was founded in Blackpool in 1947 and has built high performance sports cars there until 2006. 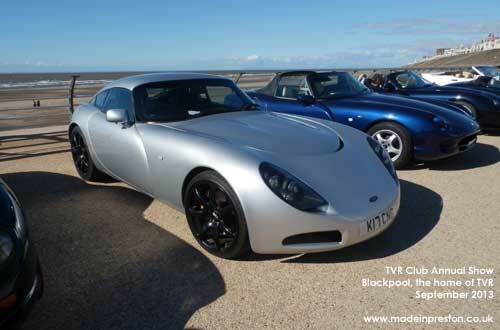 TVR has been in the news in 2006/7 relating to relocation of the factory. It was believed in 2006 that the factory would be at Squires Gate near Blackpool Airport and the HQ, design and a visitor centre will be located in Lancaster. However further business arrangements in 2007 resulted in the site being closed and the business bought and expected to be moved overseas. In 2009 there is still a small facility with the TVR badge near Junction 3 of the M55. In 2013 there is talk of the company restarting production in Surrey. One of my favourite quotes was in the article the Good, Bad and Ugly in Car Magazine. 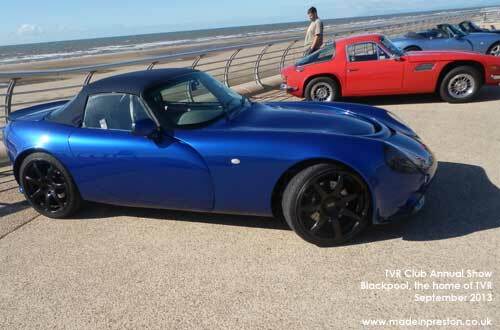 Next to TVR it said 'good in tunnels, frightens the neighbours'. The Times contained an obituary on 24th June. Trevor Wilkinson was born in Blackpool in 1923 and left school at 14 to be an apprentice in a garage. In 1946 at the age of 23 he left the garage and set up Trevcars to repair cars. In 1947 he made his first car. 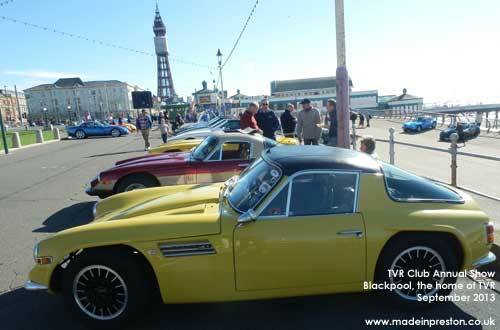 He then started TVR (based on TreVoR) and built the first TVR car, TVR1, in 1949 with Jack Pickard and sold it for ?325. 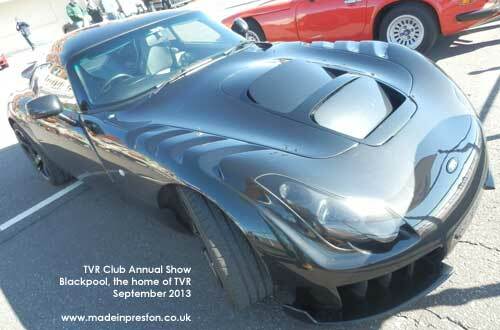 TVR2 is still around and is owned by a TVR club member in Yorkshire. TVR Mk1 was unveiled in 1959, later known as the Grantura in Britain and was popular as a cost effective ride for amateur racers. In 1962 Trevor left the company and sold it to start another company specialising in glass fibre. He later retired to Minorca. Peter Wheeler was a chemical engineer who became a successful businessman in the North Sea Oil industry. 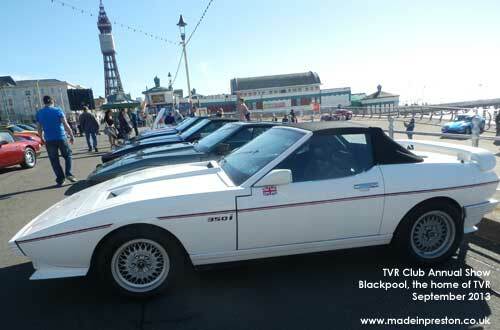 In 1980 he bought TVR from Martin Lilly who had bought it from Trevor Wilkinson the founder. Being an engineer he increased the design team to include engine and bodywork specialists, eventually producing, in conjunction with others a new engine. 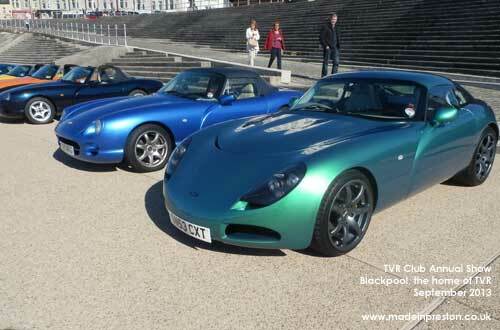 TVR engined cars up to 5 litres were produced. Wheeler saw the business build up and the Chimaera, Tuscan, Tamora, T350, Typhone and Sagaris were models of unique TVR styling. In 2004 he sold the company to a Russian businessman. Some 300 cars came and were positioned on the promenade around the Cenotaph. A beautiful day on the Saturday but the second day a forecast storm that covered the whole country curtailed the event. Some fabulous examples, photographed a bit late in the day when some had already left.